Solo Travel Archives - Travel? Yes Please! SuzieD - I think the important thing for a solo traveller is not where u go, but what options are available. I *really* recommend going on a trip with Exodus or Explore or one of those adventure companies. They are excellent and a great way to meet other people. I have been on several – the Atlas Descent Bike Trip in Morocco, Lake Garda Mountain Biking, Sea Kayaking in Greece, Multi-Activity in Turkey. Honestly, they are wonderful and – no – I do not work for them. 3. Carry your smartphone with you and join websites like Wandermates or AirBnB to help meet other people. None of them are perfect, but they are useful. Vania - I am loving your blog! Came across it when Travel Yukon posted a link to the Klondike Hwy post (one of the most beautiful drives I have been so far, aiming to brave the Dempster Hwy next year!). Shivya Nath - Love this post! Like you, I started traveling solo because life is too short to wait for company. But after all these years, I crave ‘me travel time’ once in a while for all the reasons you’ve mentioned. Marlo Basco - Its so inspiring to learn the benefits of solo travels.Im now planning to go to italy and visit milan,florence,venice & rome..plus a side trip to paris france. This will be my 2nd trip as solo traveller but first time in Europe. I did solo in the US and had a great time. Rhonda Krause - From the airport, I took the Leonardo Express train to Termini Station, which is cheaper than a cab (probably faster too) and takes you pretty much to the main part of the city. From Termini, I just walked because my hostel was close by. You can also take the metro as both lines intersect at Termini Station. We just got back from Europe and took the metro to our hotel as much as we could to save money on cabs. It was a bit challenging sometimes having to go up and down stairs with all our luggage though. There is a taxi stand at Termini Station. Official taxis are white or yellow and have the letters SPQR on them. As always, ask for an approximate price before you get in the cab and make sure they have the meter on. Another thing I do before hand is study my map and follow along on my phone (CityMaps2Go is an app you might find useful) to make sure the driver is taking me a direct route. If you feel cheated, make sure you get a receipt and write down the company and drivers’ licence number (I believe it’s written on one of the doors). Mara - I hope you don’t mind that I continue to ask you questions. How easy was it for you to converse with the locals? While I will work on mastering a few phrases before my trip, I really do not speak Italian. I do not want to stand out as a tourist, so I am concerned about walking with my luggage down the street trying to reach my hotel. I guess that is why I am thinking about taking a cab to avoid drawing any attention to myself. Obviously I have no concept of how things will be while I am in Rome. Rhonda Krause - No worries! Ask away! I don’t speak Italian either, just studied a few phrases in my guidebook on the flight over. I made an effort to use Italian for words like hello, goodbye, please and thank you and had to ask “where is…?” a few times. I didn’t have any trouble as most people were able/willing to speak some English once they saw me struggling. If you are worried about standing out as a tourist, or unsure of where to go to find your hotel, then a cab is probably money well spent, even if it is a little expensive. You want to make sure you feel comfortable. Our most recent trip we get lost trying to find our hotel and walked around for quite a while with our luggage, and I’m sure everyone who saw us knew we were lost. Rhonda Krause - That’s really great, Jack! A lot of people are hesitant to travel alone, for various reasons, but I truly believe that solo travel experiences are the most rewarding ones. It’s normal to feel nervous, but you are right, it will be an incredible experience, even if there are a few bumps in the road. Although I am married now, I still crave solo travel. I’ve actually been contemplating going back to Italy and spending a few weeks there, just me and my camera. We’ll see, but I hope I can make it happen one day. Rhonda Krause - It’s absolutely normal to feel nervous, but good for you going anyways! My solo trip to Rome was the best experience of my life, one that I still cherish 8 years later. I stayed at Pop Inn Hostel, which was right across from Termini station. I didn’t have any issues with it and loved that it was so close to the train station and public transport. It’s been many years since I stayed there, so I can’t speak to what the hostel is like today. As for getting around Rome, I walked A LOT! My legs ached so much at the end of every day, but it was worth it because I got to see so much of the city. I also used the metro quite often and the bus a few times. Metros are pretty straight forward and easy to use, but I never did get the hang of taking the bus! I didn’t have any safety concerns in Rome. The key is to project confidence and use common sense. Don’t go off with strangers, keep your valuables close and concealed, and always be alert and aware of your surroundings. If you ever feel uncomfortable or need to check your map, just pop into a nearby store or cafe. cris - Hi! I totally could relate to everything you wrote! I am 17 year old year old boy from the netherlands and i am going to toscane in italy with my parents. I want to push my boundaries (if thats correct english) and i want to travel on my own in the future so i decided to travel on my own from toscane to rome for one day. Its not a crazy adventure but it is a start. I really want to have a great experience that day so do you got any advice for me where i definitely should go? Thanks alot! That’s great that you want to do a solo adventure, even if it is just for one day! There are so many amazing places in Rome! With such a short amount of time, I’d recommend seeing the Colosseum, Palatine Hill and Roman Forum. You can buy a combined ticket for all these sights online. Buying in advance will save you time waiting in line. 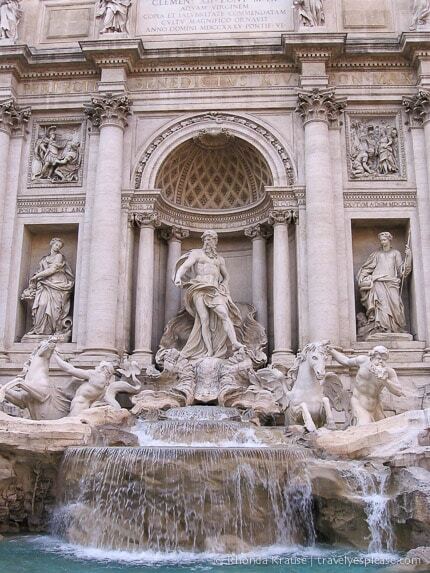 If you still have time to spare, then check out Trevi Fountain. Of course, there’s so much more to see, but I’d say those are the “must visits”. I walked to most places, but you might want to take the subway so you can get around faster. Plus, your feet won’t get so sore! I hope you have a great trip! Italy is wonderful and I’m sure you’ll love it! I am looking at travelling to Rome from Christmas to New Years. Considering the winters and that it is not particularly touristy season, would it be difficult as my first solo trip? Would Paris be better? It’ll be great if you can help me out with this. Rhonda Krause - Hi Aimee. Sounds like you have a great trip planned! I never went on any tours in Rome, apart from the Colosseum and Palatine Hill tour. I just joined a tour on the spot, but I believe you can also book on-line in advance. This might be a good idea if you think it will be a busy time in Rome. There are so many great things to see in Rome that you’ll have no trouble finding things to do for 5 days. If you like historic/archaeological sites, don’t miss Caracalla Baths and Ostia Antica (https://www.travelyesplease.com/travel-blog-ostia-antica/). They are a little bit off the typical tourist trail, but very much worth the visit. The Roman Forum is also an interesting place to see. Your post on the solo trip to Rome has given me some good amount of encouragement to start planning for my first ever solo vacation to a absolutely new part of the world – Italy. I have traveled several times alone to a new country due to my work, Seen places & discovered new cultures. However, those travels were, I would say, guarded travels as my company booked my hotel stay, which were of course the best in class, I could rent taxis from hotel to the place I wanted to go which would be reimbursed. Things are different now. When I start to plan for Italy, I am trying to look for cheaper accommodations, would probably use, train or bus more.. & then don’t know what I would say to people if they ask me what brings me to Italy!! I look forward to this trip minus all the baggage of relationship, for the first time ever. Needs courage..wish me luck. Rhonda Krause - Hi Poorva! Thank you for your comment. I’m glad my post helped encourage you to start planning your own solo trip to Italy. It’s a lovely country with a lot of the archaeological sites you like. You and your husband sound like my husband and I, as far as interests go! We also like to do some different things when we travel. Instead of one person having to compromise all the time, we will sometimes spend the day apart doing what we each like to do. Then when we meet up again we have a lot of new stuff to talk about. Lynn - Hi, I will be traveling to Rome this summer solo and I am nervous about going through the airport and getting to the Leonardo Express Train. I was wondering what exactly it was like locating the train and purchasing tickets. I don’t speak any Italian and I’m nervous I won’t be able to navigate on my own. Any advise?